20 lbs of what!??! | My kitchen musings! So I am notorious for purchasing lots of pounds of things from our local farmer’s market. Last summer is when it all started. My husband met a guy at work who knew where to get really cheap corn. I was thinking a few ears or kernals already shucked— in other words I had no idea what we were getting in to. We crossed over into Georgia and pulled up to a huge farm that sat on hundreds of acres of land. Come to find out this particular “farm” supplied corn to a good many supermarkets in the neighboring states. We ended up buying a bushel of corn, not really knowing what a bushel looks like. It ended up being about 75-80 ears of corn. Fresh, sweet. buttery, corn! This was my initial introduction to cooking on a grand scale in order to wittle down the corn! I sorta felt like Bubba in _Forest Gump_: I made corn chowder, corn fritters, corn with other veggies, cornbread, etc etc. It was pretty freakin awesome! And that is how my obsession with large quantities of produce began. This summer began with 20 lbs of tomatoes. TWICE. Then on to Blueberries. We actually went to the farm and picked our own and boy were those good! 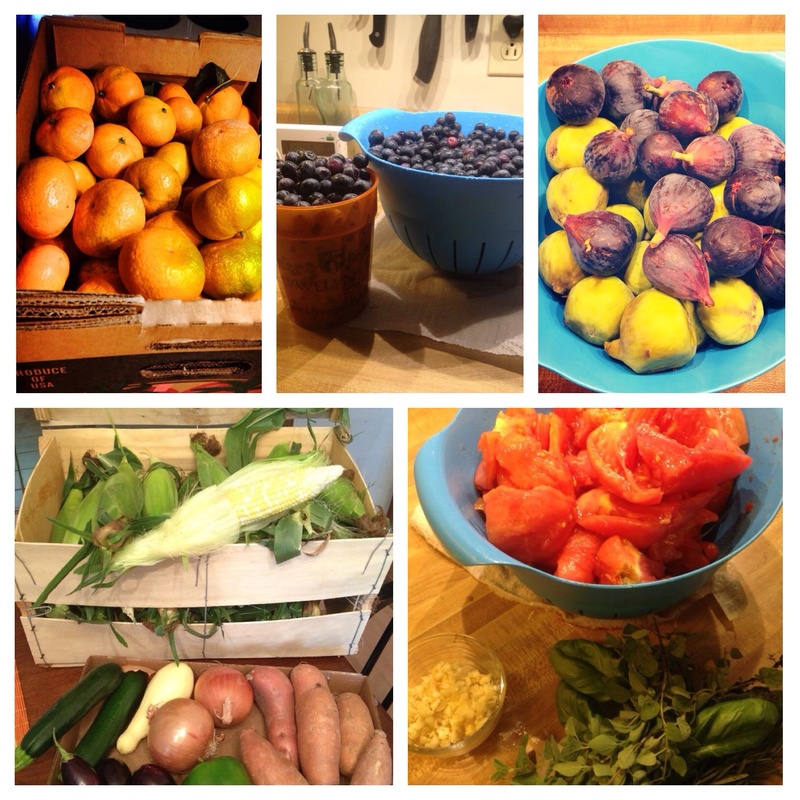 Then came the strawberries, figs, and peaches. And I was thinking that maybe that would do it for the year. But nnnooooo…satsumas came into season. 2 weeks ago I bought 20 pounds and yesterday I bought 10 more pounds AND about 15 Meyer lemons. Yep. Obsessed. I bet you’re wondering what I do with this plethora of fruit? I became a jam maker. And tomato sauce maker. And roasted tomatoes confit maker. And just roasted tomatoes (because I couldn’t figure out what to do with the last few pounds. Which make for an excellent pizza topping!) So that’s what I did. Some of the jams came out fantastic: great texture and most definitely tasted great! Others came out runny, but still pretty yummy. I’m looking over at my “pantry” (which is just a huge wire shelving unit) and I think I’ve got about 40+ jars of different jams. I just smiled. The crazy thing about all of this (other than buying in 20 lb increments) is that I thoroughly enjoy the whole canning process. I can sit in the kitchen all afternoon stirring, mixing, peeling, slicing, boiling jars, etc and I am at utter peace. Grant it my back is usually a bit mad at me, but as far as my peace of mind, it is relaxing! It’s the same way when I do a Julia recipe: as complex and lengthy as some of her recipes are, I relish the time it takes to prepare each item. And I ALWAYS look forward to making Thanksgiving dinner. From scratch. All of it. We’ll be in St. Louis this year for Thanksgiving so I’m thinking of doing a post-thanksgiving dinner once we get back. Thanksgiving dinner is my ‘piece de resistance’ of the year. And I LOVE IT! Crab legs and steamed clams for dinner tonight and flank steak marinated in a mojo sauce made with some of those yummy satsuma’s and meyer lemons…YUM! Just a small sampling of the fruits and veggies.